1 Sunny with tempo a few fair weather Cu in afternoon. Top Tmax: Kleine Brogel 19,4°C, Zaventem had 17,1°C. 2 Sunny with from late afternoon some Cu. Top Tmax: Kleine Brogel 20,5°C, Zaventem had 18,2°C. 3 During morning turning very cloudy with St, later lifting to Sc. During the afternoon even a few spots of rain, later some breaks. Top Tmax: Kleine Brogel 10,8°C, Zaventem had 9,4°C. 4 Tmin reached 1,0°C with some hoar frost. Sunny with between 0930-1500 a few fair weather Cu. Top Tmax: Kleine Brogel 13,8°C, Zaventem had 11,7°C. 5 Tmin reached 0,0°C, with hoar frost. Quite sunny but with a lot of Ci, between 1200-1400 also few Sc. Top Tmax: Kleine Brogel 17,0°C, Zaventem had 14,2°C. 6 Tmin reached 1,6°C with some hoar frost. Quite sunny with lots of Ci, between 1430-1630 a few fair weather Cu. Top Tmax: Kleine Brogel 20,1°C, Zaventem had 17,5°C. 7 Starting sunny, but cloudy to very cloudy Sc Cu between 1000-1800. Top Tmax: Kleine Brogel 13,9°C, Zaventem had 11,7°C. 8 Tmin garden 0,4°C with hoar frost. Sunny, later some Ci + tempo a few Cu. Top Tmax: Kleine Brogel 18,6°C, Zaventem 16,2°C. 9 Partly cloudy with Sc, Cu and some Ci. Top Tmax: Top Tmax: Kleine Brogel 19,7°C, Zaventem had 16,5°C. 10 Starting/ending with sun, but from noon tempo very cloudy with Cu Sc. Top Tmax: Kleine Brogel 17,8°C, Zaventem had 17,2°C. 11 A repeat of yesterdays situation, but couple of hours sooner in timing. 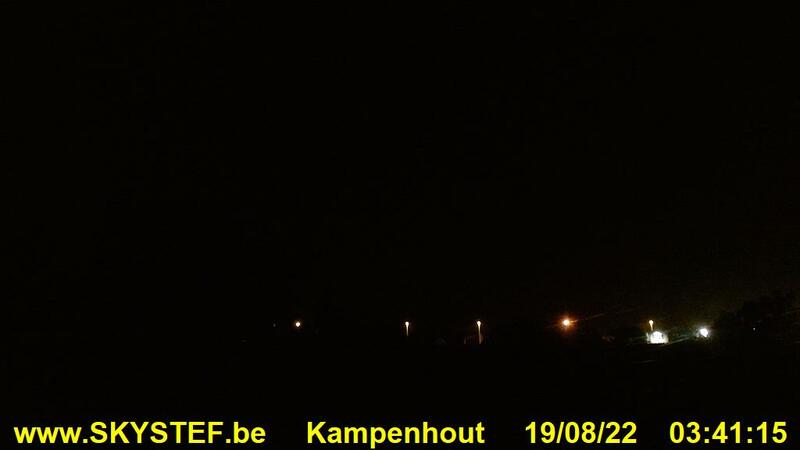 Top Tmax: Kleine Brogel 18,4°C, Zaventem had 17,2°C. 12 Quite sunny but with lots of Ci. Top Tmax: Kleine Brogel 23,6°C, Zaventem had 22,0°C. 13 Quite sunny but with lots of Ci. Top Tmax: Kleine Brogel 26,1°C, Zaventem had 24,4°C. 14 Quite sunny but with lots of Ci. Top Tmax: Kleine Brogel 28,9°C, Zaventem had 26,2°C. 15 Sunny. Top Tmax: Kleine Brogel 30,0°C, Zaventem had 27,7°C. All stations (except coast) had values between 26-29°C. 16 Sunny with a bit Ci. Top Tmax: Kleine Brogel 30,7°C, which is an all time record for April in Belgium, Zaventem had 26,6°C. 17 Becoming overcast with St from 0500 on, breaking and lifting to Cu from 1030 on with scattered to broken Ci, Cs remaining. Top Tmax: Buzenol 20,3°C, Zaventem had 17,0°C. 18 Starting cloudy to very cloudy with Ci,Cs + some Sc sheets, later the high clouds cleared but still scattered to broken Cu Sc, clearing towards sunset. Top Tmax: Charleroi 17,1°C, Zaventem had 14,1°C. 19 Starting misty, later turning sunny with few to scattered Ci. Top Tmax: Kleine Brogel 20,4°C, Zaventem had 17,6°C. 20 Starting misty, later sunny with few to scattered Ci and few Sc & Cu. Top Tmax: Kleine Brogel 16,8°C, Zaventem had 15,0°C. 21 Tmin garden 0,9°C and some hoar frost. Quite sunny with some Ci. Top Tmax: Semmerzake 17,2°C, Zaventem had 15,3°C. 22 Tmin garden 1,2°C and some hoar frost. Quite sunny with some Ci. Top Tmax: Kleine Brogel 24,1°C, Zaventem had 21,5°C. 23 Starting sunny with few Ac Ci, afternoon some Cu, from 1500 on broken Ac. Around 2130 a few rain drops. Top Tmax: Kleine Brogel 27,0°C, Zaventem had 23,5°C. 24 Cloudy to very cloudy with Ci, Cs and Ac, afternoon also some Cu. Top Tmax: Kleine Brogel 26,9°C, Zaventem had 25,0°C. 25 Partly cloudy to cloudy, with Ci, afternoon also scattered Cu. Top Tmax: Kleine Brogel 29,6°C, Zaventem had 27,6°C. 26 Partly cloudy with Ci, afternoon tempo some fair weather Cu. Top Tmax: Kleine Brogel 28,7°C, Zaventem had 26,8°C. 27 After morning fog patches, sunny with some Ci. Top Tmax: Kleine Brogel 28,9°C, Zaventem had 25,9°C. 28 Sunny, with during late afternoon & evening some Cu & Ac Sc. Top Tmax: Kleine Brogel 29,1°C, Zaventem had 26,4°C. Today, in afternoon & evening some weak to moderate thunderstorm activity over provinces of Luxembourg, Namur & Hainaut. 29 Sunny, with during late afternoon & evening invading Ci & Cs from south. Top Tmax: Semmerzake 25,3°C, Zaventem had 22,9°C. Today, in afternoon & evening some weak to moderate thunderstorm activity over provinces of Luxembourg, Liège & Namur. 30 Starting with lots of Ci but rapid clearing southwards. Top Tmax: Ghent 23,1°C, Zaventem had 20,9°C.